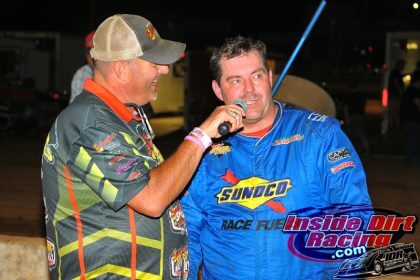 BRASSTOWN, NC (November 20, 2018)—Last Saturday’s Schaeffer’s Oil Southern Nationals Bonus Series presented by Sunoco Race Fuels and Tennessee RV event that was rained out at Boyd’s Speedway ended a five year run. The Fall Nationals Series will run in place of the Bonus Series beginning in 2019. Starting in August of 2019, the Schaeffer’s Oil Fall Nationals Series presented by Sunoco Race Fuels and Tennessee RV will begin and run through the month of November. A 10-15 race schedule is currently being finalized and will be released at the PRI Trade Show in early December along with the Spring Nationals and Southern Nationals Series schedules. “With the beginning of the Fall Nationals we will be able to now have three tours that will have three separate point funds, some good paying races and some different drivers race in each three of the series but not stretch from March until November like the Bonus Series has done in the past” stated Promoter Ray Cook introducing the new tour. During the last five seasons the Southern Nationals Bonus Series has produced some great racing action and plenty of different winners. All in all, there were 34 event winners in 63 events. Series champions have been Kenny Collins of Colbert, Ga. in 2014, David Payne of Murphy, N.C. in 2015, Donald McIntosh of Dawsonville, Ga. in 2016 and 2017. David Payne captured his second series championship and received $5,053 for his efforts this season.